Click our 2018-19 Community Service Form to download a community service form for the 2018-19 school year! Crosby Scholars are required to complete two hours of community service, although five are recommended. Scholars must submit a form documenting their hours that includes a signature of the person in charge of the service activity by the deadline noted above. The form can be submitted various ways: drop it off at the Crosby Scholars office; upload the form to the My Documents page (drop down of My Crosby page) of your Crosby Scholars Student Portal; take a picture of the form and email it to info@crosbyscholars.org; fax it to 336.725.1321; send via US mail or turn it in to your school counseling office. 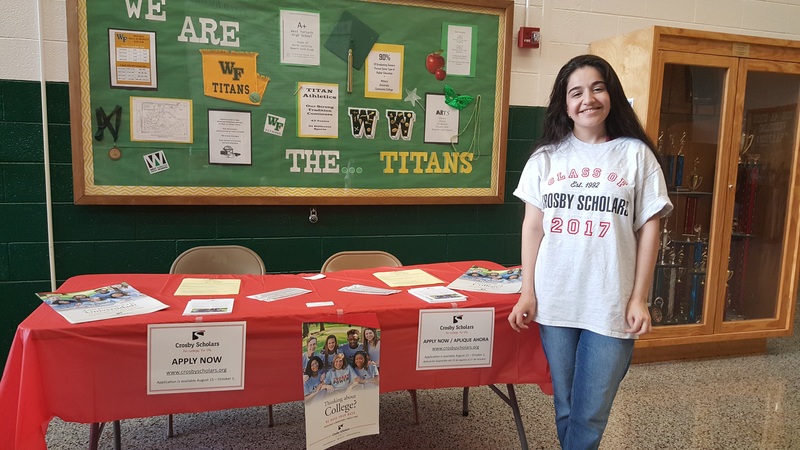 Scholars who completed the Crosby Scholars Program during the previous school year may count hours volunteered after the previous year’s deadline, including summer volunteer hours, toward the following school year’s requirement. Community service must be performed with a non-profit agency or be an activity that benefits a non-profit agency. The volunteer commitment can be fulfilled through scouts, school clubs, civic organizations, and/or certain church activities. While membership in a club or organization does not count as service, volunteering in the community in a club-sponsored activity does. For example, being a member of a youth choir doesn’t count, but singing at a nursing home with the choir qualifies as service hours. Due to our non-profit status, we are unable to accept volunteering on the political campaign of a specific candidate as community service. If you have questions about whether your community service idea meets the requirement for the Program, please contact Crosby Scholars at 336.725.5371. Crosby Scholars Program staff reserves the right to determine if a community service activity fulfills our requirement. View a list of current volunteer opportunities below. Click the link to the corresponding opportunity for more information.